1What is kinesiology tape made out of?  Kinesiology tape is made from 100% high-grade cotton, with a hypoallergenic acrylic adhesive. The tape contains no latex and no medications. This makes it very comfortable with a low probability of skin irritation. 2How do I prepare my skin before applying kinesiology tape? Before apply kinesiology tape, skin should be dry and free of any lotions, oils or creams. To ensure optimal skin condition for taping, clean with soap and water, then wipe the entire area to be taped. After clean with soap, you can use rubbing alcohol to wipe the area. 3I have been exercising; can I still apply kinesiology tape? If a person has been exercising, clean with soap and water first, then ensure that perspiration has completely stopped before applying kinesiology tape. 4What if I have hairy skin? Small amounts of body hair will not interfere with the effectiveness or adhesion of the tape. Areas with significant amounts of hair should be clipped or shaved for best results. Refer to most common causes and solution section. 1 How do I remove tape? There are several ways to remove tape, however, to minimize skin irritation, follow the instruction below. There is a strong attachment of the tape to the superficial (outer) layer of the skin. To prevent injury to this delicate structure, the tape should be removed without lifting or pulling. If tape is pulled off, it can cause the upper layer of the skin to separate from the lower layers. This damage creates what looks like a second degree burn. Should this happen, treat this damaged tissue as a burn. When removing the tape hold the end at approximately a 45 degree angle to the skin surface. Then gently push the skin down to remove it from the adhesive instead of lifting or pulling the tape from the skin. An alternative is to apply baby oil or olive oil for 15 to 20 minutes before removing tape. The cotton will absorb the oil and when gently massaged into the tape will help loosen the adhesive attachment from the skin. 1What if my skin is already damaged? Do not apply kinesiology tape on any skin surface that is damaged such as scrapes, cuts, burns, sunburn or any type of rash. 2I have sensitive skin, can I still apply tape? Individuals with sensitive skin should apply a small piece of tape for up to 24 hours before a full kinesiology taping. If skin irritation occurs during that time period, remove tape immediately. 3Is there any lotions or cream that I can apply to minimize skin irritation before or after apply tape? The following products have been reported to minimize skin irritation when applied prior or after to tape application: Benadryl Itch Stopping Gel, Maalox, TENS Clean-Cote Skin Wipes. Be sure to let any pre-taping skin preparation dry completely before applying tape. 4 What causes skin irritation with kinesiology tape? 1. Too much stretch in the tape – When kinesiology tape is applied with a great amount of stretch, it pulls on the skin as it attempts to contract back to its unstretched state. If only a small piece of tape is being used, this doesn’t usually create a problem. When larger areas of skin are covered with extremely stretched tape, however, the potential for irritation or even blistering is much greater. Solution – Regardless of the amount of stretch used in each strip of tape, the final 1-2″ should always be applied with absolutely no stretch. 3. Hair follicle irritation in unshaved areas – The benefits of kinesiology taping are achieved via direct contact between the tape and the skin. A properly applied kinesiology tape application provides continual sensory input on the skin’s surface. If the taped area has significant amounts of hair, this sensory stimulation is transmitted to the hair follicles, which can become irritated. Solution – Clip excess amounts of hair before applying kinesiology tape. Solution – To avoid hair follicle irritation from shaving, try clipping the hair close to the skin rather than shaving. Clipping leaves the top layer of skin intact, decreasing the likelihood of irritation. If the above precautions have been taken and skin irritation persists, the following products have been found to be helpful when applied to the skin prior to taping: Liquid Milk of Magnesia, Benadryl Itch Stopping Gel, Maalox, and Tens Clean Coat Skin Wipes. 5 What are kinesiology taping precautions and contraindications? 1. Do not overstretch the tape as this can cause blistering of the skin. 2. Do not apply to fragile skin or early healing tissue. 3. Do not apply to skin that has been treated with radiation because these fragile tissues may not be able to take the stress of tape application and removal. 4. Do not apply over, or near, known cancer sites. 5. Do not apply to an area of cellulitis or infection. 6. Do not apply over an open wound. 7. Do not apply to an area where there may be a blood clot. 8. Do not apply if there has been an allergic reaction to the adhesive on this product. Copyright ⓒAtex. All Rights Reserved.